Santoor is a very ancient instrument of India. The original name of this instrument was Shata-tantri Veena which in Sanskrit language means a Veena of 100 Strings. Today, when we say Veena, it means a specific instrument but in ancient times Veena was a common word for different kinds of string instruments. The first string instrument was called Pinaki-Veena. The idea to create this instrument came from the Bow & Arrow when Arrow was released it created a sound out of that idea somebody created a musical instrument and named it Pinaki Veena. Pinak in Sanskrit language means the Bow and the idea to create this instrument came from the Bow & Arrow that is why it was named Pinaki Veena. In the Western Countries this instrument is called the Harp and in India we have got a miniature form of the same instrument known as “Swarmandal” which many vocalists these days use while singing. After Pinaki Veena, in Ancient India, we had different kinds of Veenas like Baan Veena, Katyayani Veena, Rudra Veena, Saraswati Veena, Tumbru Veena, & Shata-tantri Veena. In Ancient Scriptures of India there is mention of Shata tantri Veena which is known today as “Santoor”. This instrument got its present name Santoor with the Persian language influence in our Country. There are Hundred Strings in Santoor. It is a hollow box on top of which there are 25 bridges. Each bridge used to have 4 strings resting on it. To play this instrument, two wooden mallets are used. This instrument had been in use in the Valley of Kashmir for many centuries, in a typical type of Music known as “Sufiana Mausiqi” which means a music connected with Sufi philosophy. In this style mostly Santoor is used as an accompaniment with the singers and sometimes played as a solo instrument also. In 1940s & 50s, the best known Sufiana Musicians in Kashmir Valley were Mohamed Abdullah Tibbat Baqaal and Mohamed Qaleen Baaf. Till then Santoor had never been used in Indian Classical Music. Actually outside the Valley of Kashmir nobody had seen this instrument or heard the name Santoor. Shivkumar Sharma was initiated into Music at the age of 5 (five) as a Vocalist & Tabla player. He had started performing at a very young age as a Tabla player from Radio Jammu and Srinagar. It was an intriguing choice for Shivkumar Sharma to take up Santoor as his main instrument which had never been used in Indian Classical Music before that but as it was the will and direction of his Guru & Father, he started learning Santoor. Later on Shivkumar Sharma had to carry on his experiments with Santoor for many years which improved in Tonal quality, in playing technique, in sitting posture of the instrument, in repertoire of music and emotional and spiritual expression of this instrument which has given Santoor its own distinct character. One interesting feature about Santoor is that similar kind of instruments are found in different parts of the world, with different names. In China its called Yang Quin, in Central Asian Countries Cimbale, in Iran & Iraq Santoor, in Greece Santoori, in Germany Hackbret, in Hungary Cymbalom and many European Countries and in America Hammer-Dulcimer. Noteworthy thing is only in the Valley of Kashmir we have got Hundred String Santoor whereas in all above mentioned forms the instrument has got either less or more than 100 strings. That proves a point it was known as Shata-Tantri Veena in Ancient times and that’s why still in the Valley of Kashmir Santoor has got Hundred strings and no where else. Some people claim that Santoor originated in Iran but according to Indian Musicologists and Ancient Sanskrit scriptures Santoor (Shata-tantri Veena) is an Indian instrument. There is also another theory that gypsies travelled from India to different other countries in Europe etc. probably they carried this instrument from India where it got different names and shapes in different parts of the World. In Hungary for example gypsy music is played on Cymbalom. In fact Santoor is the predecessor of Piano because it is based on the same system. There are strings inside Piano which are struck by small hammers when we press the keys of Piano. 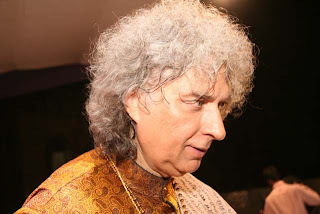 The modified Santoor which Shivkumar Sharma plays now has got 31 bridges, total number of strings 91. It has got a range of 3 Octaves and chromatic tuning. In Kashmir Santoor is kept on a wooden stand in front of the Musician while playing. Shivkumar Sharma changed that posture and started keeping it on the lap to cut the extra unrequired resonance which resulted in getting a very clear tone even while playing very fast passages like taan and Jhala. Although this is a difficult posture to maintain and requires some training of Yoga to maintain the spine in an erect form for longer duration of performance otherwise it can be difficult to sit in this posture. The height of the Musician also counts to maintain this posture. The mallets are held inbetween Index and Middle finger and the thumb. This is again very important part of holding the Mallets which is used in a very subtle form to create the meend (the technical term for playing unbroken notes). It’s a very important factor of playing this instrument, the mallet held in any other position will not produce this kind of tonal quality. There was a time when Santoor was manufactured only in Kashmir but now there are Santoor makers in Mumbai, Delhi, Kolkata, Punjab and Varanasi who are making Santoors according to the modifications carried out by Shivkumar Sharma which has become a standardized form of this instrument. All his disciples and most of the other Santoor players who may not be his direct disciples around the World are following this system of Santoor playing. As everybody knows in the field of music technicalities of playing of an instrument can only be learnt directly from the Guru otherwise picking up the technique just by listening to the records or concerts or even videos can go wrong. Shivkumar Sharma has always encouraged serious students to come and learn from him directly which he has been doing for the last 40 years.